In electric power, gas, nuclear power, oil refinery, petrochemical and pharmaceutical plants, numerous sensors are used to measure such variables as pressure, temperature and flow rate, and to automate the process. These sensors must be calibrated periodically to maintain product quality. However, because there are typically so many pressure and differential pressure transmitters out in the field, the transmitters are usually calibrated in-situ. This calibration accounts for much of plant maintenance work. Efficiency is therefore crucial to maintain uptime of equipment and facilities. The MT220 is a precision digital manometer for use with pressure/differential pressure transmitters and is designed to maximize the efficiency of field calibration work. The maximum allowable input pressure is as high as 500 kPa (such as in the 130 kPa-range model). Now you don't have to worry about sensor breakdown due to overrange pressure input. Calibration involves inputting the same pressure level to both a calibrator and a transmitter and comparing the transmitter output with a value measured by the calibrator. 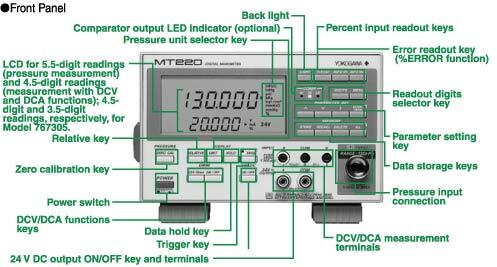 The MT220 comes with all the functions you need for such calibration work in the plant or field. Practical functions include measuring transmitter output (1-5 V or 4-20 mA), outputting 24 V DC for driving the transmitter, and indicating the transmitter output error as a percent value. The MT220 even has a pressure range pre-adjusted to that of transmitters. 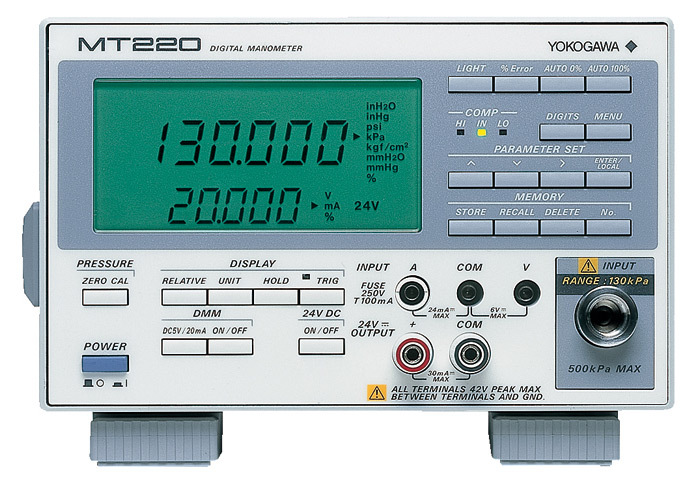 The specifications of the MT220 are based on the earlier series of MT120 manometers to ensure compatibility; both series also share the same communications commands. Many other handy functions found on the front and rear panels help you implement your specific applications successfully. The accuracy of pressure/differential pressure transmitters has continued to improve, from ±0.25% to ±0.1%, and now to ±0.075%. That means the accuracy and stability of the manometers used to calibrate these transmitters must keep pace. 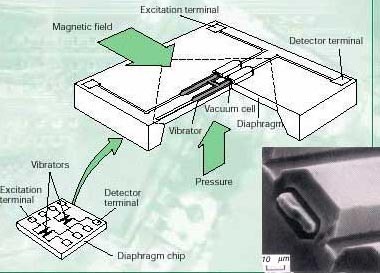 The MT220 employs Yokogawa's original silicon resonant sensor-a high precision pressure sensing device. We've also set up an advanced calibration environment, including a tightly-controlled traceability system. As a result, our calibrators feature basic accuracy as high as ±0.02%, and excellent stability. With the MT220, you can verify the performance of even the most accurate of pressure/differential pressure transmitters, i.e. ±0.075%. Yokogawa, a leading company with a proven track record in the field of industrial instruments and instrumentation, also has decades of experience in pressure measurement. We've been developing digital manometers for more than 20 years and have won a great many loyal customers. Our wide range of pressure measuring instruments offer unrivalled functionality and performance. Outputs a D/A-converted signal through the external terminal. This feature lets you easily send measurement data to a measuring system or a recorder. The comparator output provides the result of comparing an input level with preset upper and lower limits through the external terminal. You can also apply a start-of-measurement trigger using the rising edge of an external trigger signal supplied through the external trigger input. These features help automate your production/inspection lines of pressure-related products. This feature lets you read measured values into your PC or set measurement conditions from the PC. Communication is still possible even when the MT210/210F series are operated on batteries or the DC power source. LCD for 5.5-digit readings (pressure measurement) and 4.5-digit readings (measurement with DCV and DCA functions); 4.5-digit and 3.5-digit readings, respectively, for Model 767305. The EL-backlit LCD presents a clear, sharp view even in dark places. Shows the deviation from a specified pressure measurement. Adjusts the zero reading to the atmospheric pressure or vacuum. Turn on or off the DCV/DCA functions, or toggle between the functions. Used as a power supply for operating a transmitter during field calibration work. Pressure: Can be displayed as a percent with reference to your desired full scale set point. In addition, you can define selected pressure readings as the upper and lower limits of a full scale. Volt and ampere DC: Can be displayed as a percent by defining the 1-5 V or 4-20 mA range as the 0-100% range. Shows an error in the volt-DC or ampere-DC reading of a pressure measurement (transmitter output) as a percent value. Turns off the LSD of a pressure reading from the display to avoid difficulty in reading the value due to fluctuations in the LSD. 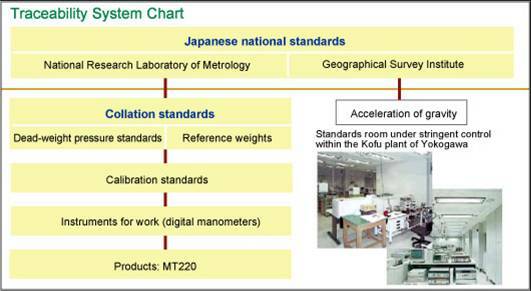 Sets the measurement conditions, communication interface, etc. Up to 2,000 data items can be stored in the internal memory. 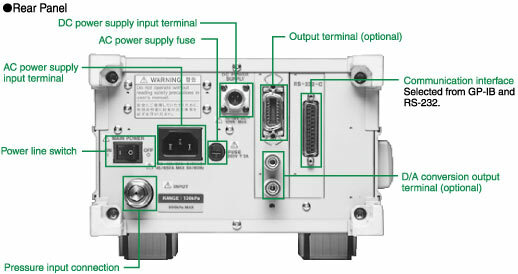 You can choose from three choices of connector configuration. The same connection is found on the rear panel. Greatly help reduce the field calibration work required for pressure/differential pressure transmitters. The current (A) terminal is protected by a built-in fuse against overrange input levels. Thanks to Yokogawa's award-winning sensor, the MT220 boasts a basic accuracy as high as ±0.02%, and high resolution. The silicon resonant sensor is also practically immune to external effects such as temperature variations. Calibrating transmitters, pressure sensors and manometers is easy. The MT220 can measure pressure with outstanding accuracy, high resolution, minimal tempco, and excellent stability.